Imagine you’re a mother who just gave birth to a 28-week-old baby. If you live in a high-income country, there’s a 90 percent chance your baby will survive and go home with you. If you live in a low-income country, there’s a 90 percent chance your baby will die within the first few days of life. Each year, an estimated 15 million babies are born prematurely worldwide—and this number is growing. Moreover, nearly a million premature babies die before their fifth birthday, usually within the first month of life. Although preterm birth is a problem in every country, low-income countries are disproportionately affected because they have both higher rates of preterm birth and lower rates of survival. We know how to reduce deaths due to preterm birth—now, we must translate that knowledge into action and provide quality care at scale. Three-quarters of preterm babies could be saved with current, cost-effective interventions. In August 2015, the World Health Organization (WHO) released the first-ever set of recommendations on the management of women at risk of preterm childbirth and the care of preterm babies. The U.S. Agency for International Development’s global Maternal and Child Survival Program (MCSP), which is led by Jhpiego, has been a leader in defining this agenda and taking action to ensure that frontline health care workers are prepared to provide quality services for pregnant women at risk of preterm childbirth and for their preterm babies. MCSP works with countries and ministries of health on programs for the continuum of women’s reproductive life, especially programs that focus on women facing complications in their pregnancies. MCSP empowers countries to design effective approaches, develop technical skills, apply analytical tools, manage workforce capacity and devote resources to reduce inequities in care and build sustainable health systems to keep mothers, newborns and children alive and healthy. MCSP’s programs offer guidance and services for encouraging healthy timing and spacing of pregnancy, providing early and high-quality prenatal care, administering antibiotics to women who have early rupture of the amniotic sac and strengthening care for low birthweight or premature babies with Kangaroo Mother Care. The graphic below (scroll over) illustrates the interventions that are recommended along the continuum of care to prevent and manage preterm birth. Context matters for improving care for preterm babies. Although preparing skilled health workers is essential, we must also address issues beyond training, such as availability of essential supplies and commodities, organization of and linkages between services and cultural practices and expectations that influence the survival of premature babies. Because the survival of a premature baby is influenced by interventions during pregnancy and after birth, it is essential that we coordinate care for pregnant women who are at risk of giving birth prematurely and care of their unborn babies. The use of antenatal corticosteroids (ACS), a medication given to women at risk of giving birth prematurely in order to mature the lungs of the unborn fetus, highlights the importance of context in determining the outcome of treatment. In high-resource settings, the use of ACS has been demonstrated to reduce the severity of respiratory distress syndrome, a leading cause of death for premature babies. In settings with high-quality maternal and postnatal preterm birth care, the use of ACS by women at risk of early childbirth (between 24 to 34 weeks of pregnancy) has been associated with an average mortality reduction of 30 percent for preterm infants. However, recent evidence demonstrates that this potentially powerful intervention might not produce the same results across all settings. 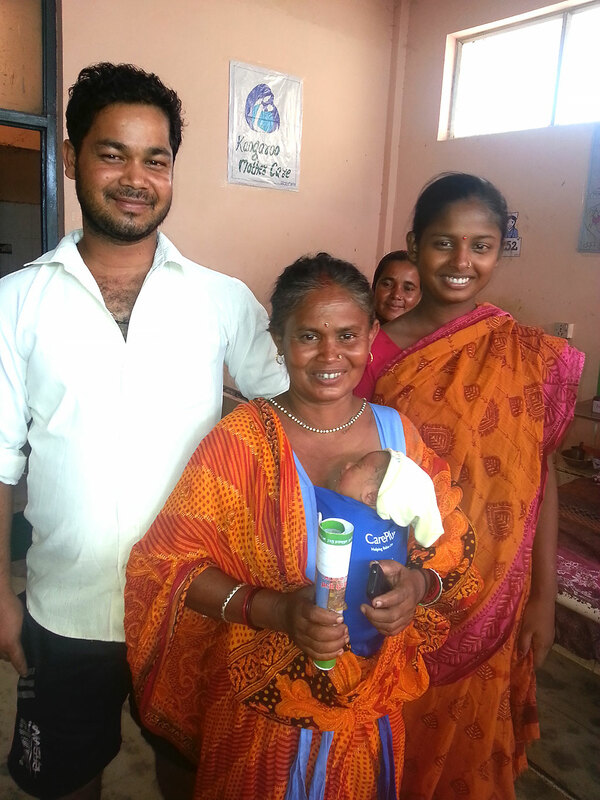 When ACS was widely used for women at risk of preterm delivery in six low-resource countries—during the Antenatal Corticosteroids Trial in 2014—there was an increase in newborn deaths among larger infants and no effect in smaller infants. There are two leading theories as to why this was the case: the wrong women were getting ACS because of challenges in making the right diagnosis; and providers and health systems lacked the skills and materials to provide adequate care for premature babies after birth. The recently released WHO preterm birth guidelines clarify several preconditions for ACS use in low-resource settings, including the availability of special care for the preterm baby. Maternal and newborn health care providers must work together to ensure adherence to WHO’s recommendations to achieve better outcomes for premature babies. to improve the survival of premature babies. Caring for a premature baby is a family affair in Nepal. The baby boy weighed 2.25kg at birth. Nurses recommended kangaroo care, swaddling the baby to the chest to promote warmth and breastfeeding. Here, paternal grandmother Bed Devi Kewarat takes a shift to relieve the mother, Kushbu Devi Das, and maternal grandmother, Gita Devi Das, as the proud dad Sudesh Kumar Das watches. Providing care to mothers and babies together through coordinated maternal and newborn health services can improve the survival of preterm infants. Sadly, programming to strengthen clinical services is often carried out in clinical silos, and maternal care and newborn care are often artificially separated. MCSP is an integrated platform working to change this. Across the globe, maternal, newborn and family planning teams at health facilities are working together to strengthen the delivery of harmonized maternal and newborn care. MCSP is also promoting improved integration at the facility level by promoting the formation and support of perinatal teams: a mix of all cadres that coordinate care and address gaps to improve the quality of maternal and newborn care. MCSP will continue to identify the most appropriate mix of preterm birth interventions in the 22 countries where we work. Together, we’re moving closer to ending preventable preterm deaths. 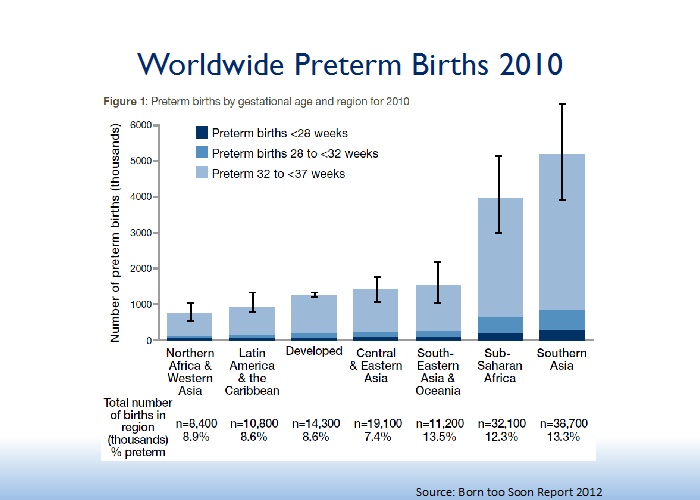 Source: Born Too Soon: The Global Action Report on Preterm Birth 2012.